It's hard to believe it's been a week since the Boston Marathon bombings. A split second can change your life, for better or for worse. This tragedy has brought out the good in so many people and companies. Of of these companies is Go Sport ID. They have made a bracelet that reads Run For All. All For Run. Boston 4/15/13, and all proceeds are going to the One Fund Boston fundraising campaign. That's right. All. Proceeds. This fund will help those most affected by last week's bombing. I can't take away the bad that happened to so many, but I can be part of the good that will help them recover from this tragedy. Join me in buying a bracelet, or ten, to help. What happened yesterday in Boston was so horrific. 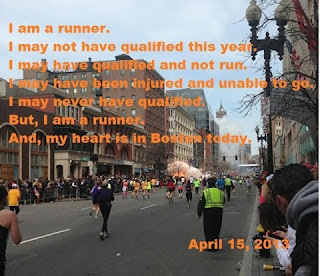 All afternoon, Twitter and FB were buzzing, as so many of us tried to find out if our friends who were running Boston were ok. Thankfully, none of the runners/family members that I know were physically injured, but it was so close for some of them, it's scary. It sickens and saddens me that someone could do something so awful, but as someone who worked in New York City for many, many years, I know there are evil people out there. Today, it's not about the bling. Today, it's not about pace. Today, it's not about PRs. Today, it's about unity. Today, it's about solidarity. Today, it's about community. My prayers go out to all who were affected by the tragic attack in Boston.